Under the terms of the deal for Cerberus to buy Chrysler, the ex-Home Depot chief took the helm at the struggling carmaker. (Fortune) -- As the deal to sell Chrysler to Cerberus Capital Management finally came to a close on Friday, there was one rather salient fact that slipped under the radar. Robert Nardelli was appointed Chrysler's chairman and chief executive officer upon the deal's completion. That's right. Ceberus has confirmed that the disgraced former CEO of Home Depot (Charts, Fortune 500), who became the poster child for excessive CEO compensation, has taken the reigns at Chrysler. On the day the deal was finalized, August 3, Nardelli was elected to the Chrysler board. Soon after, the directors appointed him chairman and chief executive. 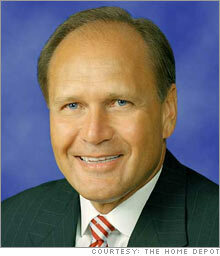 Bob Nardelli, Chrysler's new CEO. However, a source inside Cerberus says that Nardelli will receive only $1 a year in base salary. This person would not go into detail regarding the rest of Nardelli's pay package, and would only add that Nardelli's pay will be directly tied to the success of Chrysler's turnaround. Tom LaSorda, who has been CEO of the Chrysler Group since September 1, 2005, will be vice-chairman and remain president of Chrysler, reporting to Nardelli. The carmaker's chief operating officer, Eric Ridenour, has elected to leave the new company, and the COO position will not be filled. So far, no one will say why Ridenour chose to leave. "We are excited to welcome Bob to the Chrysler family," said LaSorda in a statement. "Bob has a proven track record of success and an unwavering focus on performance, and brings deep operational experience and a broad industry background to Chrysler. His background in operations will provide valuable knowledge as we continue Chrysler's turnaround." Rumors have swirled since March that Cerberus was thinking of hiring Nardelli, who also worked at General Electric (Charts, Fortune 500), when CNBC reported that the private investment firm had offered him a spot as a so-called operations specialist. Cerberus has collected a huge bench of former executives to act as advisors on deals and serve on the boards of its portfolio companies. Former GE employees who now work for Cerberus include Paul Bossidy, Michael Williams and Jeffrey Fenton. A person within Cerberus says Nardelli never officially worked for the firm. Nardelli angered Home Depot shareholders when he refused to take questions during a shareholder meeting in May 2006 as the stock was floundering. His rich pay package drew fire; he earned $38.1 million last year. Ultimately he was forced out of the company in January 2007, but left with a $210 million golden parachute in cash and stock options that included a $20 million severance payment and retirement benefits of $32 million. To be sure, plenty of executives before Nardelli have gotten away with big paychecks and imperious behavior. In the end, it was the stock price that got him. As Bernie Marcus, co-founder of Home Depot, told Fortune after Nardelli's departure, "if the stock had doubled, who would have cared? Instead it went nowhere, and that's what this is all about." By the time Nardelli left the retail chain, its shares were trading at about the same price as when he arrived in 2000. Moreover, analysts said that the stock had actually lost about 40% of its value because a series of stock buybacks had reduced the amount of shares available. But Nardelli argued that share price was just one metric used to judge the success of a corporate leader. And it's true that other metrics improved during his tenure. Home Depot's return on capital grew to almost 20 percent, about ten percentage points above the firm's cost of capital; and sales soared from $46 billion when he arrived in 2000 to $81.5 billion in 2005. Over the same period, profits more than doubled to nearly $6 billion. Before his rise and fall at Home Depot, Nardelli had also been a success at GE, the company where he worked for 27 years before losing the CEO spot to Jeff Immelt. Nardelli was the head of GE's Canadian appliance unit, then he moved on to the transportation systems division. He later transformed the GE Power Systems unit into one of the conglomerate's most profitable divisions. Now that the private investment firm Cerberus owns 80.1% of Chrysler, the company will be able to implement its turnaround plan without the pressure of quarterly earnings that dogged Nardelli. Even so, his reputation as an effective leader was tarnished by his stint at Home Depot. The recent Chrysler sale to Cerberus is high profile and risky, as is putting Nardelli in the top spot. The turnaround is considered a bellwether for both the future of U.S. auto manufacturing and the fate of labor unions. Additionally, some contend that the problems that investment banks had securitizing the loans Ceberus made to Chrysler are evidence that the heady days of private equity dealmaking are coming to a close. Even so, a source at Cerberus says his firm is confident that Nardelli has what it takes to fix the ailing company that is weighed down by nearly $19 billion in pension and retiree healthcare costs.